There are 24 No Prize Reward Coupons included in this bundle. This resource was created to be a reward for activities to participants without costing you any money from your budget but at the same time offering something more meaningful than breakables, trinkets, and costly items. These coupons can also be used as your “store”. If participants receive funny money, lucky loot, bingo bucks, points, raffle tickets, crazy currency, IOU’s, etc. they can use their money to purchase these reward coupons. Requiring participants to save their money and buy coupons of things/items they really want makes the “prize” more meaningful as opposed to receiving donated or dollar store items. To set up the “store” make a list of all coupons that you are willing to give as prizes and the “price” of each coupon next to it so they can “shop”. To make it interesting, change out the coupons monthly or quarterly. This way participant’s do not get bored with the same prizes. The best thing about these coupons is that they do not cost you anything but the time it takes to print and cut. 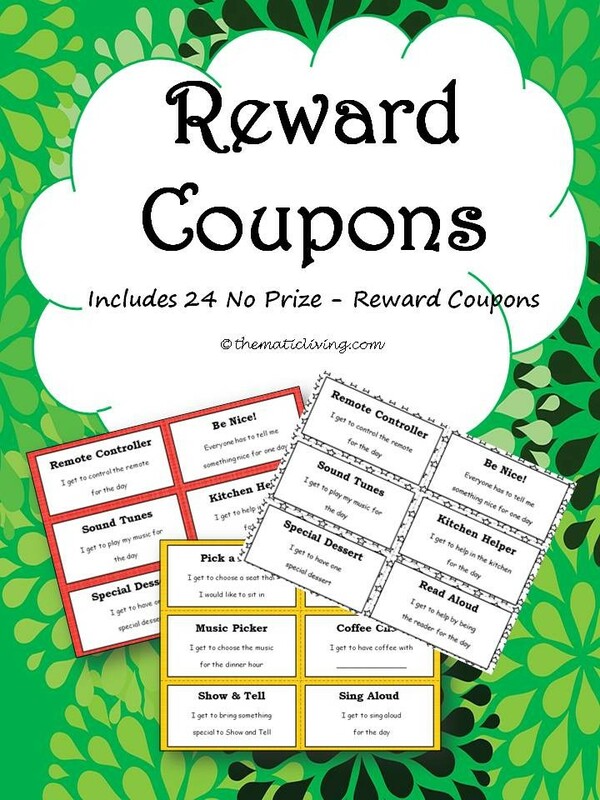 I would suggest printing the color version on cardstock or to save on ink, print the black and white version on colored cardstock for a simple yet colorful way to enjoy these amazing No Prize Reward Coupons. I would suggest laminating the coupons for extended durability so they can be reused for a lifetime. You will need to create a procedure for how to earn, when to distribute prizes, and how to redeem the reward coupons. After the coupons are distributed you will need to decide if you will use a special stamp or write the participant’s initials on each coupon in order to prevent theft, loss, or replication. This resource includes a color and black/white version. There are two separate sets of cards: 6 coupons per page; 1 coupon per page. Also included are blank and editable coupons so that you can personalize this resource to your preferences. This resource will save you not only money, but your time as well. These rewards are ready made and cover different topics to cater to different interests within your group. You can offer a survey to your participants and submit the survey to Thematic Living in order to receive even more reward coupon ideas. Only the participants will be able to tell you what they really want to earn. You can store the coupons in an index card file box, a small photo album, in an envelope, or in rainbow loom containers. Keeping each coupon in one place will prevent participants from saying that they never received one or that they lost it. When it is time to redeem the coupons, they will all be in one place and easily accessible. You can also place all coupons in a bag and participants reach in without looking and whatever coupon they pull out is their prize also called “Grab Bag”. You can place a number of coupons on a spinner and have participants "Spin to Win" a prize; whatever coupon they land on is the prize that they would receive. Using this method may result in some participants receiving coupons that they do not necessarily want. You can host a “Trading Day” for participants to trade coupons for the reward that they really want as opposed to the one they were given. Another reason you will want to “host” this activity is to prevent any unfair trading or stealing. Use the editable coupons to make rewards that best fit your group of participants.